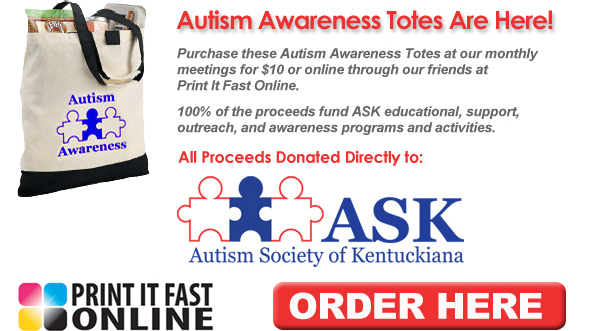 The Autism Society of Kentuckiana (ASK) is a non-profit organization serving Greater Louisville and Southern Indiana that provides support for families affected by Autism Spectrum Disorders. ASK provides resources and education for families and individuals through our monthly meetings, workshops and social events. ASK is run completely by volunteers and relies on membership dues, fundraisers and donations to fund its services. ASK became a chartered chapter of the Autism Society of America (ASA) in the early 1990's. Through the years hundreds of families have attended our meetings. Currently we usually have approximately 10-20 families attending ASK monthly meetings. We are unique in that we offer free childcare by trained staff during our meetings, not only for the child with autism, but for siblings as well. We have a different guest speaker every other month and chose speakers based on requests and interests of the group. Topics may include: types of therapy, new technology, advocacy, and IEPs. We also have speakers from various local agencies to inform our members of available services. During meetings without guest speakers, we offer general support, ask questions and get to know each other. As a chapter of the Autism Society of America (ASA), we follow their options policy, which is (in part) to promote the active and informed involvement of family members and the individual with autism in the planning of individualized and appropriate services and support. To read the complete ASA options policy, visit Autism Society of America-Options Policy. Following our national organization’s policy, ASK believes that all individuals with autism have the right to access appropriate services and support based on their needs and desires. Our mission is to assist families and individuals in doing so.